One of the best shows since Powerpuff Girls. I must admit that I am not a fan of the Cartoon Network school of animation. Space Ghost is hilarious, the Powerpuff Girls are cute (if repetitive) and Dexter's Lab has many moments of genius, but pretty much the rest of their original programming makes me want to gag. So it was with a sense of duty and not anticipation that I attended the premier of Samurai Jack at the San Diego Comic Con. Now, they told us that we were watching Cartoon Network's Samurai Jack, but I think they must have played the wrong tapes. What they did show was a beautiful 75 minute art film with an amazing soundtrack, wonderful characters, and a very sophisticated sense of humor. It was genius! The story opens with an intense and psychedelic sequence of the shape-shifting demon god Aku escaping from imprisonment in the earth. This sequence on its own would win awards at an independent European animation festival, but it's only the tip of Samurai Jack's iceberg. Aku then proceeds to ravage a medieval Japanese city until he is confronted by a noble samurai with an enchanted sword. The samurai keeps Aku at bay long enough for his wife and son to get away. The story then follows the samurai's son as he is passed from culture to culture, developing his warrior skills. He learns to ride with the Arabs, sail with the Vikings, spar with the Ethiopians, practice kung fu with the Chinese, etc. Once he has become a man, the young samurai returns to Japan to meet with his mother, who gives him the enchanted sword of his father. Then it's back to Japan to free his people from Aku's cruel reign. The samurai defeats Aku, but there is a twist- Aku transports the samurai far into the future so that he and his descendants can't stop the demon from taking over the Earth. What's most impressive about this first act is that it's 95% dialogue free! It's not until the young Jack confronts Aku that we get any real dialogue. The creepy music and beautiful animation do a wonderful job at keeping the viewer's attention. That Cartoon Network would allow the very first episode of a series to be so abstract is a miracle, but I'm very glad it happened. 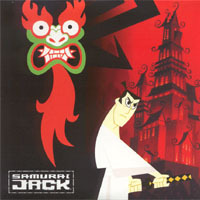 The second and third parts of the premier movie take the samurai far into the future, where his acrobatics and swordplay earn him the nickname "Jack". In this future, the evil Aku has enslaved the people of Earth and turned the planet into an intergalactic trading port for smugglers and criminals. Jack is soon enlisted by a group of canine archaeologists who are being forced by Aku to dig up valuable gems when they'd rather learn about their ancestors who walked on all fours and couldn't talk. The final standoff between Jack and the scarab armies of Aku is very impressive, although the slow motion and split-screen techniques are perhaps a bit overused. Despite it's Japanese inspiration, Samurai Jack is definitely not attempting to be anime. There are motion lines in some of the fight scenes, but overall, it looks more like vintage Disney shorts than it does Rurouni Kenshin. But with its mature themes, slower pacing, and abstract action, I think that anime fans might be the most able to adapt to the show. In Samurai Jack, I think that the Cartoon Network school of animation has really matured from a cheap alternative to "proper" animation, into a real artform. Creator Genndy Tartakovsky uses the low cel count, simple character designs, and bright colors to create something that is beautiful, exciting, fun, and entirely unique. How will this play on prime time TV? With the creepy and mostly dialogue-free soundtrack and the abstract split-screen action, I'm sure a lot of mainstream watchers will be put off by the movie premier. It's their loss. With Samurai Jack, the "Adult Swim" block on Cartoon Network, and Invader Zim on Nickelodeon, America finally seems to be getting what anime fans have known all along: animation is not just for kids- it can be so much more.